Our cartridge cases for Retro Replay, MMC64 and other standard C64 cartridges enjoy great popularity, therefore we have made a new production run with a few improvements. The cases that we delivered previously were made out of the fairly soft plastic polystyrene. To further improve the quality and stability of dimensions under extreme climatic conditions, we decided to use the harder plastic polycarbonate. In addition to the known colours black, blue-transparent and clear-transparent, the new colours red-transparent and solid blue are now available. Even though polycarbonate is much more expensive than polystyrene, we did not raise the sales price. We even took away the price difference for the different colours, so each case is now 4,- EUR incl. 16% VAT (plus shipment cost, please inquire by eMail). There's only two quantity scales: The single price for purchases of up to 99 units, and 15% discount for orders of 100 units or more. Colours can be mixed in order to reach the quantity scale. 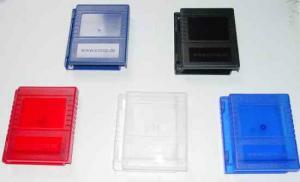 The cases are closed with only one opening for the cartridge connector. If a cartridge with buttons or a pass-through slot shall be used, the holes/openings must be cut into the case. This applies to both the Retro Replay and the MMC64. If you order the bundle with Retro Replay and RR-Net, you can now choose from these case colours. Wordwide shipment is already included in the bundle price of 100,- EUR for the three items! Many products for the Amiga are only made for the clockport of the A1200 for economy reasons. Individual Computers has been shipping Zorro cards with an additional expansion port for many years. This expansion port is compatible with the A1200 clockport, but at the same time has a much better performance. Especially for Zorro-systems (so-called "bigbox-Amigas"), we're now offering a bundle with our ISDN-card ISDN-Surfer, which also features a clockport. For the "smaller" Amigas A500 and A1000 we have the clockport adapter for the CPU-socket. Please bear in mind that both the Delfina and the Subway USB-card by E3B require a 68020 or higher processor. All bundles include 16% VAT and worldwide/international shipping! Please use the contact form of our website www.ami.ga for ordering.